LATAM Airlines Group is working to maintain adequate liquidity levels during 2016 to withstand the still challenging economic situation in much of Latin America. Although its ratios ticked up at YE2015, those metrics have actually remained relatively stable during the last couple of years. Brazil’s recession remains a drag on the region, and as a result LATAM has decided to expand its planned capacity decreases, both in the country’s domestic market and also on routes between Brazil and North America. Although currency devaluation remains a drag in LATAM’s Spanish-speaking markets, demand in those countries continues to be relatively healthy, with Argentina in particular showing signs of strength. LATAM has also reduced its fleet commitments for the 2016 to 2018 time period and has financing for the USD2 billion in aircraft that it plans to spend for 2016. The company is taking necessary steps to weather some of the toughest conditions it has experienced in decades – against a backdrop of a slow and uncertain recovery. A key focus for LATAM during 2016 is maintaining stable liquidity during a period of economic uncertainty in Latin America, most powerfully driven by a projected 2.5% contraction in Brazil’s economy for the year after a nearly 4% decrease in the country’s GDP during 2015. 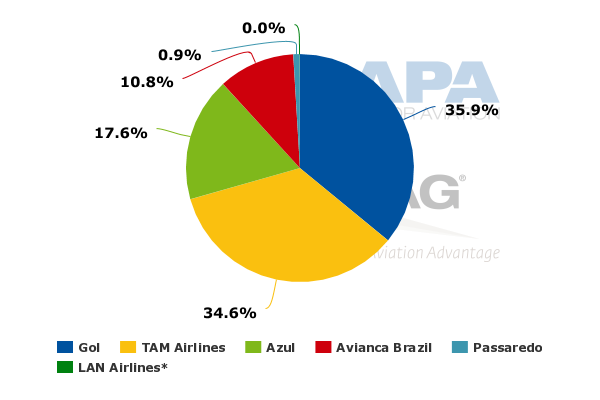 Although LATAM is geographically diverse, with operating airlines in Latin America’s key markets, Brazil is the country’s largest domestic market and TAM represents approximately 35% of the country’s domestic ASKs, putting it largely on equal footing with its rival Gol. The situation in Brazil has been a major hindrance for all airlines operating within and to Latin America during the last year. LATAM’s Brazilian domestic unit revenues for 4Q2015 measured in USD sank 37.8% year-on-year. Measured in the BRD, domestic Brazilian unit revenues increased 2.3%. The BRL’s depreciation against the USD was a plummet of 50.8% year-on-year in 4Q2015. The economic challenges for Brazil itself, which is Latin America’s largest aviation market, are forcing airlines serving the country to adjust their expectations and ensure that their balance sheets are robust enough to handle lingering economic uncertainty. LATAM’s net debt to EBITDAR ratio actually increased to 5.8x at YE2015, compared with 5.4x the year prior. The increase was driven by a USD500 million bond that the company issued in 2015 and an overall EBITDAR that fell 2.6% year-on-year. At one point LATAM’s net debt to EBITDAR was 6.5x, so the company has made progress in improving its leverage ratios. Back in 2013, LATAM aimed to lower its ratio to 3.5x in four years, but the economic situation in Brazil could extend the deadline for reaching that target. Prior to the merger of LAN and TAM, LAN held a coveted investment-grade credit rating. Cash balances for LATAM at YE2016 settled at USD1.4 billion, which was approximately 13.4% of the company’s trailing 12M revenues. It has stated that its goal is to maintain liquidity levels between USD1.4 billion and USD1.5 billion. Similarly to most airlines operating to Brazil and within the country, LATAM has been cutting capacity in its Brazilian market. 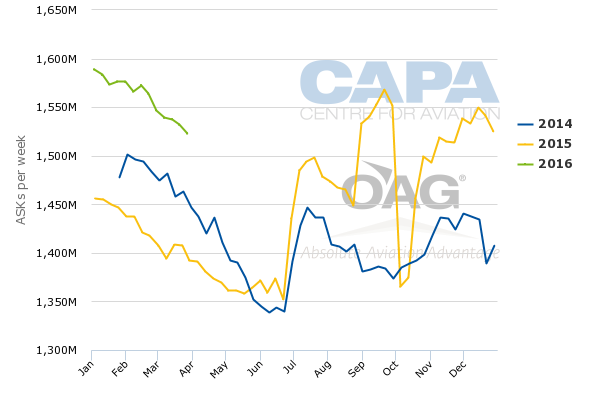 In 2015 capacity on TAM’s domestic routes in Brazil fell 2.5% year-on-year. Recently LATAM has expanded its planned capacity reductions in the market for 2016, from a 6% to 9% reduction to an 8% to 10% decrease. 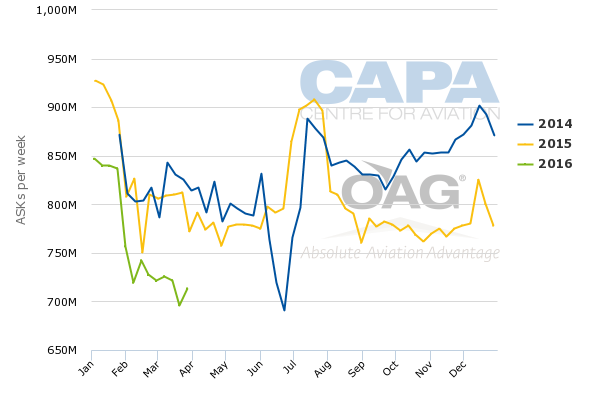 TAM’s weekly domestic ASKs have fallen sharply in Feb and Mar-2016; for the week of 14-Mar-2016 its capacity within the domestic market has fallen nearly 11%. The cuts should help to lift LATAM’s domestic yields in Brazil but obviously the company is working off a low base. LATAM’s system yields for 2015 measured in USD fell 21% year-on-year. Although the company is taking care to maintain schedule integrity on important corporate routes, LATAM has concluded that Brazil’s corporate demand will remain quite depressed for the short term. In addition to revising its planned capacity cuts within Brazil downward, LATAM is cutting capacity by 25% between Brazil and North America in 2H2016. The adjustments include the elimination of flights from LATAM’s Brasília hub to Orlando International in Jun-2016. TAM’s removal of the service follows Delta’s exit from the pairing in early 2016. TAM is also reducing frequencies from Rio de Janeiro, São Paulo and Fortaleza to Miami. TAM operates alongside oneworld partner American on flights from Rio and São Paulo to Miami, and is the sole airlines offering service between Fortaleza and Miami. The capacity cuts between Brazil to North America have resulted in LATAM revising its 2016 ASK forecast for international routes downwards from growth of 4% to 6% to an increase of 3% to 5%. The company stated that it still intends to grow on the international routes from its Spanish-speaking countries to the US and Europe. Most of the growth is driven by aircraft upgauge to the Boeing 787-9, from older 767 widebodies. At YE2015 LATAM had seven 787-9 jets in its fleet and it has nine remaining on order. LATAM’s previous projections of 6% to 8% domestic capacity growth for 2016 in its Spanish-speaking countries remain intact (those countries are Argentina, Chile, Colombia, Ecuador and Peru). The airline cites healthy demand in those countries, even as the national currencies continue to depreciate. In 4Q2015 currencies in Colombia, Argentina and Chile fell 40.5%, 19.4% and 16.6% against the USD, respectively,. Demand in Argentina is holding steady, LATAM has said, driven by the lifting of a 35% tax on purchases completed with credit cards. Tickets are now cheaper than they were previously even at the same exchange rate, said LATAM. With the lifting of the tax, demand in Argentina has not been affected to the same degree as in other countries with sluggish economies. LATAM also noted that currency controls in Argentina were abolished three months ago. The lifting of those controls makes less likely a similar scenario to that in Venezuela, where airlines have funds trapped in the country. System-wide ASKs (international and domestic) are up year-on-year in early 2016. At the end of 2015 Argentina elected a new president, Mauricio Marci, who has pledged to keep flag carrier Aerolineas Argentinas under state control. For more than a year LATAM has been working to reduce its fleet funding commitments as conditions in Latin America have worsened -- the region’s economic growth in 2015 contracted 0.3%, and some forecasts indicate another decrease for 2016. In early 2016 LATAM executives explained that one year ago its financial commitments for its fleet totalled USD7.7billion between 2016 and 2018. The company has now reduced that by USD2.9 billion, for a total of USD4.8 billion. LATAM’s USD2 billion fleet commitments for 2016 have been fully financed. Of that amount, USD1.1 billion is being financed through sale/leaseback and operating leases; another portion is supported by an EETC (Enhanced Equipment Trust Certificate) that LATAM issued in 2015 and USD400 million is supported by export-credit agency loans and commercial loans. The company plans to shed 13 aircraft in 2016 and add 20 for a net addition of seven jets. Its fleet commitments in 2017 total USD1.4 billion and USD1.5 billion in 2018. Orders include those placed directly by the operator and by lessors assigned to the operator, from 17-Mar-2016 onwards. Similarly to most airlines in Latin America, LATAM is making logical and necessary moves to combat weakness in a region that just a couple of years ago was considered an emerging growth powerhouse. LATAM executives are periodically questioned about the merger between LAN and TAM, given the tough situation in Brazil. Obviously, the tie-up was forged on an assumption that over the long term Brazil would remain the largest aviation in market in Latin America, and the combination of the two airlines places LATAM in a decidedly powerful position once conditions improve. None of that logic has changed, or arguably could be challenged. But in the short to medium term LATAM joins its Latin American counterparts, taking the necessary steps to ensure that it can withstand economic weakness that is showing few signs of improvement for the immediate future.